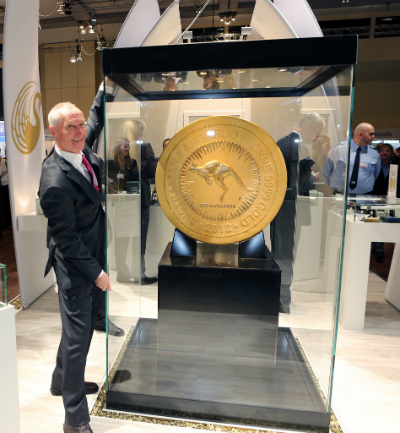 In 2012 the Perth Mint issued a one tonne gold coin - the largest and most valuable coin ever produced. The coin is part of the popular nugget series (also known as Kangaroos). 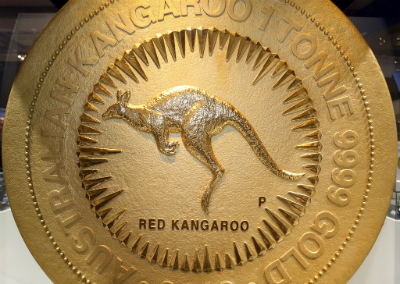 The obverse features Queen Elizabeth's portrait, whilst the reverse depicts the red kangaroo. The Official Perth Mint video shows how the coin was created. Although we do not have the coin in stock we would assume it to be around £24,406,000.00 (as of 10th January, 2013). If you are interested in the coin please contact us. We will be unable to quote a firm price, as we do not have it in stock, but we will be able to give you an indication. 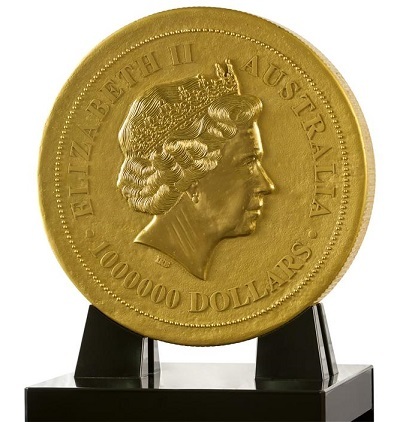 For interested collectors or investors, for a refundable deposit of 1%(say �250,000) we will commence negotiations with the Perth Mint for a firm price or premium indication. We would suggest a minimum guide price starting at �25 million. As you can imagine, we have no idea how to transport a one tonne coin. We checked with Royal Mail but the size and weight of the coin more than exceeds their limits. We are sure that we will be able to find a way.